A huge thank you to "Truth Dental Clinic"! My two sons(6 years and 4 years old) came to see a dentist for the first time in their life and they have such a great fun!!! (I've also learnt a lot about how to communicate "Dental matters" with them. I am pleased and extremely happy with the service received so far! Truth Dental Clinic, see you again! The treatment here is really very good & i can feel doctors here are professional. I would definitely come back here for the check-up in future. Thank you . 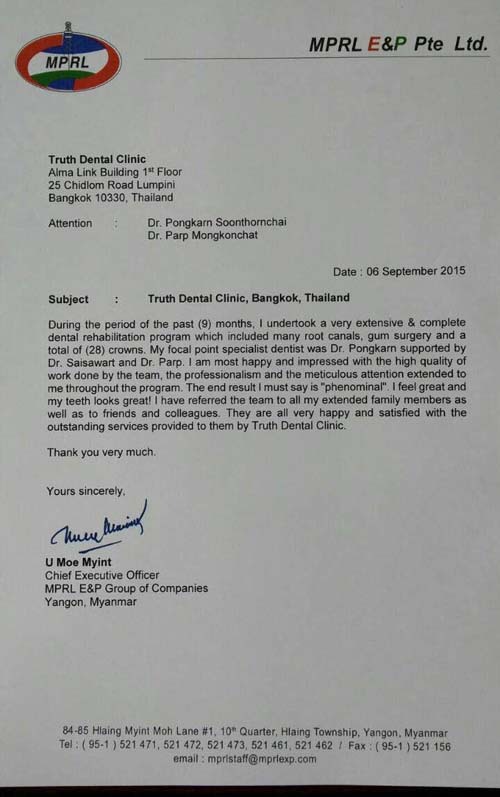 I have been a patient at truth dental clinic since April 2014. Dr.Parp has been my main doctor I have undergone various treatments including filling, crown replacement/re positioning, cleaning, whitening I am extremely happy with the quality of the work, the attention towards making each visit painless, the exceptional facilities/staff. I world very strongly encourage anyone to try the clinic what is provided. This is one of very best experience in Thailand. Clean, Professional, smile & good service. Excellent & Professional service and facilities. My new dentist in Thailand When I am away from the UK, this is where I come. Excellent dental clinic very good service, Professional and though examination and work. All the staff are polite and pleasant highly recommend. You are good as long as you give me my tooth Thank you. When I step in the truth dental clinic, it gave me the different feeling of the usual dental clinic which normally has the goose bumpy noise and smell. It is perfect for all ages from children to old adults. The doctors and staffs are friendly, decent and patient; they listen to you and explain to you well. The best part is they were flexible enough to fix the teeth according to my stays in Bangkok. I was there with recommendation and I would definitely recommend my beloved ones too. Dr.Parp is one of my favorite doctors and by far my favorite dentist. I live in U.S. Helpful than any of my dentist in the U.S.
she is very caring, knowledgeable and skilled so grateful she is my dentist. A Fantastic and educational service I have never before received anywhere else in the world. Dr.Parp Mongkonchat was simply amazing. She taught so much and gave personal service which I appricate so much because it with help me in my future care. I have now fund my dentist in Thailand and I am already looking forward to the next visit. I truly and HIGHTY recommend Truth Dental Clinic!! I have been seen checked and treated by Dr.Parp for more than 1 year. She is very kind and every time giving enough explanation to understand. Other staffs are also very nice to me, which makes me feel that I want to come to clinic ever only for check-up. Thank you for all the time. I am very happy with Truth dental. The service is very professional and friendly, the equipment modern and the clinic well managed and maintained. The services provided are worth the money charged. It was very thorough & she give good advice for maintenance, will definitely recommend her to my friend &family. Friendly staff and very good service! I can really recommend this dental clinic. My husband and I had our dental check-up and were surprised to learn that we had two and three decay teeth. The dentist helped with the filling works. We had wonderful experience. Highly recommend for those who need good dentist. Truth dental is a good clinic, clean,friendly staff and Dr.Puttipon is an excellent dentist. Truth Dental Clinic offered me and my 2 sons (3y and 6y old) seriousness, pedagogy and almost pleasure while going to the dentist. My 6 years old did not fear going after the second session. As per myself i have been happily surprised by the genuine and thoughtful advises of the residing dentists. To all in this world that needs a dentist, if you are going to Thailand for any reason, take out 1 hr of your time and go to Truth Dental for a check up. 1. I have had Dr Parp as my dentist for over 10 years. 2. She is an excellent dentist. 3. The staff are very professional. 4. The location of the clinic is good. 5. The general cost is reasonable. 6. All in all Dr Parp is very helpful and will put you at ease on your visit. For a long time I have avoided going to a dentist. Finally I could not avoid attending to my teeth any longer. Realizing I may need quite a bit of work, and it may be a bit costly, I took time to visit five dental clinics in Bangkok to get an idea of how they would treat my teeth, and what the costs would be. Dr. Parp and her team at Truth Dental always provide friendly, hygienic and expert service for myself and my family, from simple procedures like cleanings and check-ups, to more involved treatments like fillings and Invisalign. I feel as comfortable and confident at Truth Dental as I would at my dentist in my home country. Even my two year old likes to come to visit Dr. Parp's office!" For me, I received implant. I never been done before. This is probably the best because when he has done with me, it was so quick and I didn't realize it is done already. So soft. I didnt' feel pain or sensitivity at all. I think this is the only one that I can come because the dentist is so professional. I am very pleased with the service at Truth Dental. Everyone is very helpful and kind. I am very pleased with the treatment I have had will always come back. Now I been visit that clinic 4 times, and every time Dr Parp and her wonderful team make me comfortable. I`ve got a good information about the treatment, and I`m so satisfied about the work they do. The clinic is easy to find, 1st floor around the corner at Chid lom centre, in Alma Link Building. I can pretty much recommend that clinic to everyone.